Chuck model numbers for the various lathes are listed below. The chucks should be purchased with handwheel rotation to closure that corresponds to the rotation of the spindle. 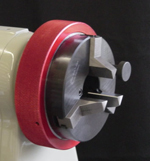 If a spindle rotates clockwise, it requires the counter-clockwise chuck. If it rotates counter-clockwise, it requires the clockwise chuck. The handwheel rotation relationship is denoted by ‘C’ for clockwise to close and ‘CC’ for counter-clockwise to close. of the spindle. If a spindle rotates clockwise, it requires the counter-clockwise chuck. If it rotates counter-clockwise, it requires the clockwise chuck. ‘CC’ for counter-clockwise to close.